Barstow’s has a lot of loyal followers. And some of those dutiful followers are oddly specific to one item or another sold in the store. There are the die-hard pierogi fans, the Barstow’s famous chili worshipers, the cinnamon swirl fanatics, the chicken salad fundamentalists, and the Barstow’s ground beef zealots. But no group is more devoted than the Lil’ Steve’s Eggs following. Raised and laid just 800 feet from Barstow’s Dairy Store and Bakery on Barstow’s Longview Farm, it doesn’t get any fresher than that! Steve Barstow, 6’6″, isn’t exactly “little.” But being son of Steven Barstow, Steve Barstow is the second. Steve purchased the chicks several years ago. 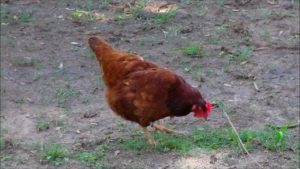 They were free to roam about the barn yard… but also the restaurant parking lot and Route 47… The free range chickens attracted a lot of attention from local owls, eagles, hawks, fox, and raccoons. Finally, with a few too many gone missing, the farmers constructed a hen house and predator proof fence and screen so the birds could cluck in peace. The hens spend much of their time socializing out in the daylight. They are allowed out each day, regardless of the weather, and shuffled in to roost during the night. They receive a diet of grain, water, and sunlight. 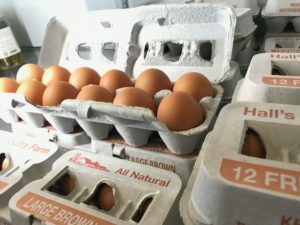 And while they are called Lil’ Steve’s eggs – it is actually Shannon Barstow, Barstow’s manager and head baker, that tends to the chickens and gathers their eggs. You’ll have to start the petition to change the name to Shan’s Eggs! Our happy egg following frequently remarks on the quality, freshness, and bright orange yolk of Lil’ Steve’s Eggs. Our hens are most busy in the spring and summer time when the light is longer – but they do lay year round. Come check out these delicious eggs for yourself!